Two nights ago we had our artist's talk at YYZ Artist's Outlet, where we showed some videos of the stashes being discovered and discussed the projects in more depth. Some interesting revelations came out of the talk. The most interesting point, I think, was that while Geocaching focuses on the hunt and hardly at all on the object that is found, our Geostashing project focuses almost entirely on the objects that were found and not nearly as much on the trek to find it. This wasn't put forward as a virtue or a flaw, but just a different kind of approach that resulted from putting so much emphasis on the contents of the stash from the very beginning. Here's a shot of us at the table, with the banana bread that we gave away visible in the corner! From left to right: Willy Le Maitre, Paola Poletto, Jon Sasaki, Gabe Sawhney, Jason Van Horne, and Duncan Walker. * Slavica Ceperkovic's work will be presented by the curators. The Geostash weekend was successful, surprising, and all-consuming. We had a great time and were impressed with the diversity of the projects. I'm working on cutting the video documentation now, and will post a notice here when it's ready. In the meantime, I look forward to blog posts from our Geostash participants with their thoughts on the experience. Of course I also look forward to our artists' talk at YYZ Artist's Outlet on November 17, and for those not in the Toronto area, I will post a summary of the presentations at that talk here on the blog. Early Sunday morning, we met with Jason Van Horne and Duncan Walker, who were assigned to Willy's stash. The coordinates led us into Mount Pleasant Cemetary. Soon they discovered a stash behind a tombstone marked "Nixon". They opened the display case and took out two portable CD players, which were to provide the soundtrack for the experience. They were led into a nearby ravine, where the experience continued. The GPS coordinates led them into a series of tunnels, where they discovered a second stash containing a light and some fortifications for their journey. The tone was set by the "Nixon" tombstone, with inscriptions above tunnel entries referring to different periods in American history, for example the "Black Gold" tunnel, referring to the recent wars in the Middle East. The GPS coordinates kept them on track, leading them further into the ravine. The tunnels were full of water from a weekend of rain, causing our intrepid explorers to occasionally be obliged to empty water out of their boots. The path continued in and out of tunnels, sometimes causing our artists/explorers to hang on when the terrain seemed rough. After leaving several tunnels, the last exit came at the end of the longest tunnel (complete with huge resident spiders). An appropriately big finish to a big weekend! And then walked a few hundred yards from that location, where we contemplated hiding parts of Willy's stash in a very open area, but thought better of it, and then ended up hiding some of it in a wooded area and decided Willy would return very early in the morning to set up the stash for the artists at the location he had chosen. A very elaborate stash with lots of work put into it, we couldn't wait for the next morning to watch the artists do it! Jon and Paola were the designers of the next stash, that was a "reverse stash", meaning, nothing was hidden for artists to find, rather, they had to rendezvous with the stash designers, find some items in the area and log their location, and then participate in a group activity, and log the location of the activity. There we received instructions to locate the ingredients for banana bread (the recipe was provided), go to a team member or curator's house, and make the banana bread together. We had to provide photographic proof that we had baked the bread. We were allowed to enjoy the bread after baking, but were obliged to save some which would remain frozen until our panel talk at YYZ Artists Outlet in 2 weeks, where we would share the remaining bread with the public. In no time, we had whipped up some banana bread, with everyone taking part in the process (though I must admit, I was trying to catch up on blogging, and participated mostly by enjoying the nice aroma coming from the oven.) They baked for about half an hour, after which time we checked them, then saw that they were done, and couldn't resist eating it while it was still hot. Yum! The lucky visitors to our artists' talk on November 17th at YYZ will have great snacks! Jon and Paola were charged with finding Slavica's stash. We armed them with the GPS receiver and they set out to the beach, while occasionally taking some time to gaze out over the shore. On a good day, you can see Rochester. Soon they found it. They discovered inside a public napping kit, complete with inflatable mattress, sheets, eye masks, shell-shaped pillows and an alarm clock. Since it was starting to rain, Jon and Paola inflated the mattress in the shelter of a tree, but with a good view of the beach. They got under the covers and relaxed, though soon it started to pour rain! They enjoyed a short nap anyway! We placed it by some rocks near the shore and then went straight over to meet the artists matched with this stash! Willy Le Maitre wandered with the GPS receiver near Cherry Beach, and soon discovered the stash left by Gabe and Shawn. Eighty grand in counterfeit, some lighter fluid, tape, a shovel, a toque, and a note. The note's tone was panicked - "Just find a way to get rid of the money, it's no good to us no more, the bills are marked. Get rid of it and get out of there." Willy went closer to the shore, and he soon put the lighter fluid to work, stashing the cash in the sand, scattering some on the grass and setting the rest aflame. Willy also tried to offer some of the cash to some passersby, but he didn't get any takers. Instead, we had a bonfire and then left the scene. Shawn and Gabe roved around the area a bit, trying to find the best location for the stash. Shawn was armed with the GPS receiver, while Gabe carried the (rather heavy!) stash. We can't show you exactly where it's hidden, but here's a view of Shawn in a wild part of the area armed with the GPS receiver. Then we parted ways, and Michael and I were off to meet the next artist! TORONTO (CP) _ Taking a page from adventure-seeking backpackers and hikers, a group of urban artists is planning to use GPS technology for a high-tech treasure hunt this weekend. The goal isn't to find their way around a lake or to a campground but to beautify the city as part of a game they've dubbed "geostash." Five teams have put together a "stash" of art supplies to be hidden somewhere in the city. An opposing team will receive co-ordinates and a basic global positioning system (GPS) unit to help find the stash. The unit uses signals from satellites to pinpoint an exact location on the ground. The team must then use the found items to create public art on the spot. The concept of the game isn't new. Geostash is a modification of geocaching, an online game that has taken the Internet by storm in recent years. Around the world, GPS enthusiasts hide items such as disposable cameras and post the co-ordinates online for strangers. Even families have started playing. 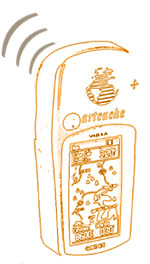 The majority of activity is based out of www.geocaching.com but there are plenty of other sites that orchestrate hunts as well. "We wanted to expand on the idea because traditionally all geocaching does is find an item," said Michelle Kasprzak, the 27-year-old curator of the Toronto art project. "It's building on the tradition of orienteering. It's cool to say you found an object but what if it was something you could do something with instead? We think artists are the best people to expand on that notion and try something a little different." Kasprzak and co-curator Michael Alstad will follow the artists around to document the activity, posting the results on a blog, www.year01.com/geostash/blog. Participating artist Shawn Micallef equates geostashing and geocaching with a traditional pirate hunt. "In the olden days they had treasure maps with a bunch of dots and an X marking the spot," said the 30-year-old Torontonian. "With GPS you can just be given the co-ordinates of X and use the device to drag you to the location." Micallef was drawn to the project because it allows him to use technology "where it's not necessarily designed to be used." "GPS is used by canoers when they're out in the wilderness. It's interesting using GPS in an urban environment where you kind of know where you are because there are signs and real maps," he said. "You don't really have to use GPS in the city. It flips technology around to use it in a different way." It's not Micallef's first foray into digitally inspired installations. Last year he and some friends started a project called Murmur in Vancouver and Montreal. It came to Toronto this past summer. As part of Murmur, signs displaying a phone number are plastered throughout a city. Passersby use cellphones to dial in and listen to an audio documentary of the specific location's history. We started by searching using the GPS receiver. Before long, Slavica had found the stash and opened it up. Slavica was matched with Jason Van Horne and Duncan Walker, and the stash contents included a sprayer filled with latex paint and some printed information. The enclosed note read (in part): "Your mission is to help in the fight against the Concrete Cartel by reducing the Grey-Level in this sector of the city by the use of site-specific mood enhancing colour applications. [...] You may get hassled for the joy you're bringing to the city, but please remember dear citizen of Toronto, "You Belong Here!" ... and so does your colour! [...] HUE HEALING: PURPLE/VIOLET: Transformational, Inspirational and Calming. Time to relax and enjoy spiritual growth and transformation; reach those levels of inner peace where you can experience that life thread that connects us to the heavens. Achieve Divine Knowingness through the use of Purple." Slavica decided an adjacent parking lot was a prime location for young lovers to go parking, and thought it needed a little colour to transform it into a "Lover's Lot". She marked the entrance to the lot with some inviting purple, and created "designated" lover's parking spots by marking the concrete barriers. Of course, it won't be dry for a little while so Slavica left some signs to warn people. Tonight we hide our first stash, officially starting the Geostash project! The next four days will be very full, with artists hiding, seeking, and creating all over the city of Toronto. We'll be posting pictures, commentary, GPS coordinates, and other information here on the blog, as events unfold.